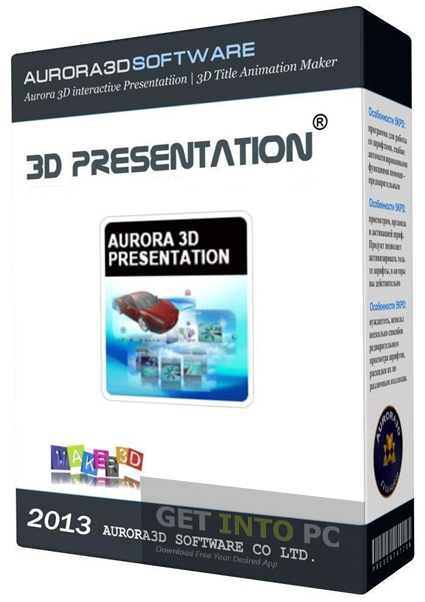 Aurora 3D Presentation Free Download Latest Version for Windows. 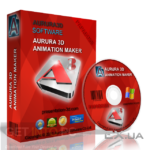 it is full offline installer standalone setup of Aurora 3D Presentation for 32 bit 64 Bit. 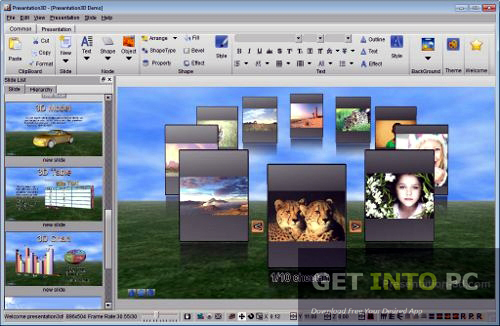 Aurora 3D Presentation is an application which will allow you to create 3D presentations of any format. You can also add your own digital content like images, videos and audio files. The application is loaded with lots of templates which will help you to create models quickly. Working with Aurora 3D Presentation is quite simple and you don’t need to perform anything else other than just adding your content into your presentation. 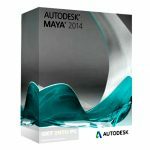 Aurora 3D Presentation is very easy to use and you don’t need any special knowledge of 3D designing in order to get the full juice out of this software. Creating some compelling presentations with this application is quite an easy job. You can put your images to an image wall and this wall can be made animated at will. You can organize your images to animate on multiple paths for example curved or straight. You can add 3D models of almost all formats and after adding the models you can make them rotate and can also change the colors of your models. You can also Download Business MX which is another great alternative. There are numerous interactive backgrounds included in this application and you can choose anyone of them according to your liking. Then you can also add 2D as well as 3D text into your presentations. 2D text can have shadow with it while there are several textures available for 3D text that can be applied. The generated 3D presentation can be exported as a video file and you can export the video into multiple formats like flv, mp4, avi and mpg etc. Tables and charts from any other application like MS Excel can be imported into Aurora 3D Presentation and can be made more appealing with cool animation. You can also Download Aurora 3D Text and Logo Maker which is another great tool. On an ending note we can say that Aurora 3D Presentation is a very handy application that can be used for creating some compelling 3D presentations. Below are some noticeable features which you’ll experience after Aurora 3D Presentation free download. 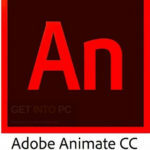 Can create 3D animation in any format. Can add your own images and videos. 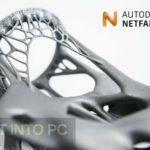 No need to acquire 3D designing knowledge. 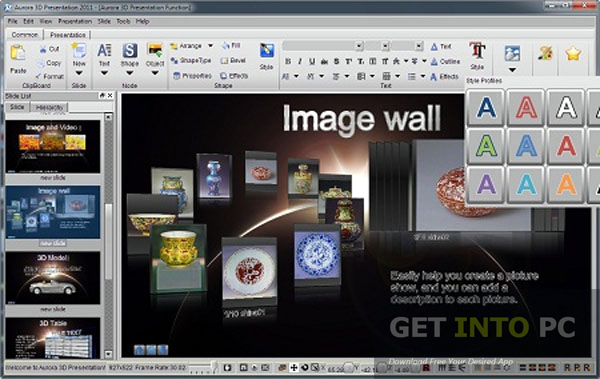 Image wall feature included for adding images in a more creative way. Can add 2D as well as 3D text. 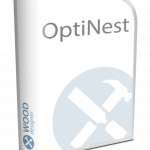 Presentations can be exported as a video of any format. 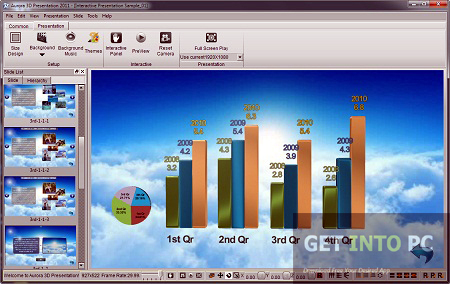 Tables and charts can be imported in order to give more compelling look. Before you start Aurora 3D Presentation free download, make sure your PC meets minimum system requirements. Memory (RAM): 1GB or RAM required. Click on below button to start Aurora 3D Presentation Free Download. This is complete offline installer and standalone setup for Aurora 3D Presentation. This would be compatible with both 32 bit and 64 bit windows.